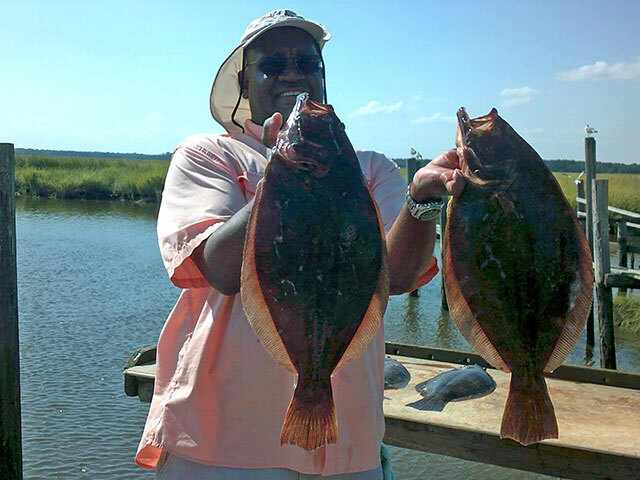 Head on down to Husted’s Landing and catch some fish like these flounders! Need a flounder recipe? Click here. Eating grilled flounder is a heart-healthy way to incorporate essential nutrients into your diet. The American Heart Association recommends eating baked or grilled fish at least two times each week, or about 7 ounces per week. Flounder is an excellent source of dietary protein, important for growth and development in children and maintenance and repair of skin, organ and muscle tissue. According to the U.S. Department of Agriculture National Nutrient Database, a 3-ounce portion of grilled flounder cooked using dry heat contains about 13 grams of protein, 2 grams of fat and no carbohydrates. Read more here. Flounder is good eating. I used to fish for those with my family when I was growing up. I didn’t know they were back in the bay. Time to go fishing!